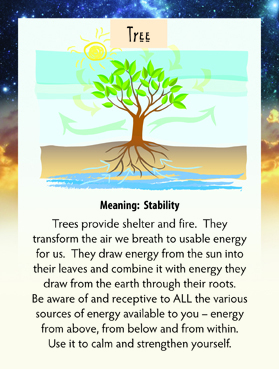 This week we have drawn the Tree Card. For those of us in more temperate climates, it is the time of year when we start to see the blossoms on the trees after a barren winter. Trees are such an integral part of our lives, but more importantly, they are a role model of what we can be ourselves. Trees provide oxygen, shelter from the sun, building materials for shelter, fuel for fires, fruit and nuts to eat, and material to make furniture, bowls, and art. But how are they role models for us? They have their feet firmly planted on (in) mother earth and draw sustenance from her, yet her arms reach up to the sky and draw energy from the sun. Then they combine those two energies and make all those wonderful things mentioned above for all to freely use. This gives us an opportunity to review all that we draw sustenance from and what we produce from that. Where do you draw your energy from and who do you give it to? Think about it this week…and don’t forget to go out and hug a tree too!